The elbow joint is a hinge joint of the arm. The bone of the upper arm (humerus) and the two bones of the forearm (ulna and radius) join at the elbow. The elbow joint allows the forearm to bend and extend and to roll from side to side. 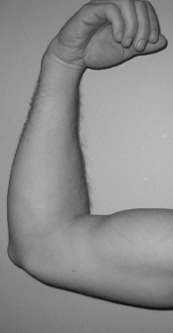 The elbow is a common site of injury, especially from sports. Elbow joint pain due to arthritis will have marked swelling and tenderness between the groove of the olecranon process and the lateral epicondyle. Elbow joint pain due to bursitis will have superficial swelling of the olecranon bursa which suggests bursitis. The pain and condition may be acute bursitis or chronic bursitis. Either acute or chronic, bursitis of the olecranon will give elbow joint pain of similar nature. When the elbow joint is fractured there will be severe pain post traumatic injury. There will be local tenderness in the elbow joint along with reluctance to move the joint due to pain. A painful tender medial epicondyle of the elbow joint suggests medial epicondilitis It is also commonly known as a pitchers elbow or little league elbow. There is general pain of the elbow joint when there is resistance against wrist flexion. Rheumatoid nodules are subcutaneous firm and non tender. These nodules of the elbow joint are found along the extensor suface of the ulna and may attach to the underlying periosteum. They are commonly found in disorders of theumatoid arthritis or acute rheumatic fever. A painful and tender lateral epicondyle of the elbow joint suggests tennis elbow or lateral epicondylitis Extension of the wrist against resistance increases the pain. Tiger Balm Arthritis Rub Cream Tiger Balm Analgesic 4 oz.